If your hair breaks with gentle pulling, it is dry and weak. Oil your hair religiously every week before shampoo. Everyday hair wash isn't for you. Don't forget to condition your hair after every wash. Hair becomes dry when the hair shafts do not absorb or retain enough moisture, resulting in a brittle, lackluster appearance. This can be due to illness or nutritional deficiencies, use of harsh hair products, excessively washing your hair, exposure to chlorinated water, and frequent use of heated styling tools or hair dye. Avoid these causes. Taking care of hair that is naturally dry can be quite a task. And what with the unruly frizz that tends to always be a companion of dry hair, not to mention the dull, lifeless look it gives your locks, making it look presentable can give the best of us a harrowing time. But worry not. For help is at hand. Preferably one without a sulphate ingredient. Chemicals like Sodium Lauryl Sulphate tend to rob hair of its moisturizing content and end up leaving it dry and brittle. So, switching to a mild shampoo is an effective dry hair treatment. Use a moisturizing conditioner without fail every single time you shampoo. It can help put back some of the moisture that the shampoo may have robbed from your hair. Another dry hair care tip would involve avoid shampooing your hair everyday as it can cause damage to your already dry hair a lot more. Once or twice a week is good enough. This will preserve the natural oils in your hair. If you must, wash it with just water in between. This could give you some natural glow. To give your hair a dry hair treatment, use almond oil, olive oil, coconut oil, sesame oil, and mustard oil because they are some of your hair’s best friends. Massage before washing once a week. 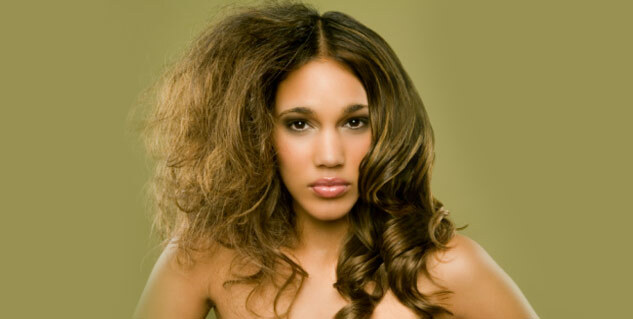 Curling irons, hair dryers, straightening irons can all damage your dry hair. Hence, use them with caution and never overdo it, if you really want dry hair cure to work. These products that use heat to style and mould your hair will leave them damaged and drier than before. Some conditioners will even give you a frizz-free look. Look out for those. Rub a few drops of oil on your palm after you wash your hair, and rub it into half dry hair. This can act as a natural frizz removing technique. Dry hair lacks natural oil and moisture required to lend it natural sheen and a soft texture. As a result, hair looks brittle as well as dull. Home remedies for dry hair can help to nourish hair and prevent hair damage without any side-effects. To start, drink a lot of water. You should take 6 to 10 glasses of water every day. This really helps in regaining the lost moisture of the scalp and hair. One of the most effective home remedies for dry hair is to mix aloe vera gel and curd in equal parts and apply it on your scalp. Leave it on for about 30 minutes and then rinse your hair with water. Use this remedy twice a week to witness significant results. You can also apply eggs on your scalp. Beat two eggs and add a few drops of lemon juice and one teaspoon of olive oil in a bowl. Apply this mix on your hair as well as your scalp. Let it dry for an hour. Wash your hair thoroughly using a mild herbal shampoo. Mash 2 bananas and 2 teaspoons of honey. Apply on your dry hair; leave it on for an hour and then shampoo. This is also one of the most effective home remedies for dry hair. Another useful home remedy for dry hair is the use of mayonnaise on your hair. A mayonnaise pack works wonders for the hair, making them soft and shiny. Always pre-condition hair that is brittle or excessively dry before shampooing. Coconut oil, castor oil and olive oil are excellent pre-conditioners. Application of aromatic essential oils stimulates the oil glands thereby alleviating excessive dryness. Increase the intake of zinc and omega-3 fatty acids in your diet to reduce dryness and get healthy beautiful looking tresses. Dryness of hair can also be caused due to stress, imbalance in hormone levels or other health issues. Meditation, yoga and alternative therapies can also be followed in addition to the aforementioned remedies for positive results. A healthy diet, vitamin and mineral supplements and home remedies for dry hair can help in getting rid of lifeless and dull hair naturally.